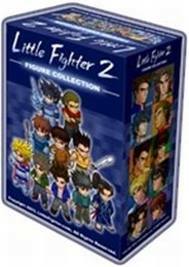 Little Fighter 2 is an outstanding sequel to Little Fighter, one of the best beat-'em-up games ever made. LF2 lets up to eight players, any of whom can be computer- or human-controlled, join the all-out fistfights that feature cute Japanese SD-style graphics and cool weapons. Now you can play against friends over a network, organize players into teams for an all-out fisticuffs, or join in the Stage Fight mode that moves from one stage to the next, similar to arcade games.